One of the top scenic trails in the country. Trail goes through three national parks. High Sierra scenery. Regarded by many as the premier hiking trail in the country, the John Muir Trail (JMT) runs along the backbone of California’s High Sierra between Yosemite National Park and the summit of Mount Whitney, the highest point in the contiguous United States. 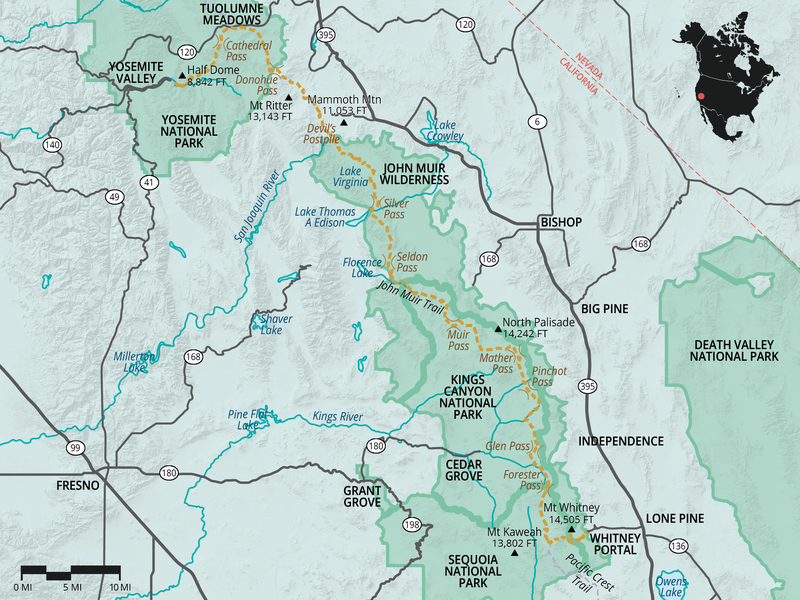 The 211-mile-long trail commemorates the influential naturalist and founder of the Sierra Club, John Muir. Muir’s understanding of the ecology and natural forces acting on the Sierra Nevada and his adamant voice for conservation laid the groundwork for protecting much of the mountain range through the establishment of Yosemite, Kings Canyon, and Sequoia National Parks. Anyone hiking a section or the entirety of the JMT will experience firsthand the impact Muir left on these iconic lands, as the trail runs entirely through national park lands and/or designated wilderness. The vast majority of the JMT shares footsteps with one of the most scenic sections of the Pacific Crest Trail, where mile after mile of High Sierra peaks, passes and lakes will leave the hiker awe-struck by the display nature has on offer. The JMT can be done in segments or as a thru-hike, many opting for the latter and the experience of completing the storied trail in one go. Segments of the JMT can be picked up as portions of loops accessed from both the west or east sides of the Sierra. Those hiking the JMT in segments may take many years or a lifetime to link it all together, slowing down and enjoying the intricacies that each mile has to offer. Segmenting the trail and taking a slower pace allows for additional exploration of the Sierra’s vast backcountry, including side trips for both adventurous and relaxing undertakings such as peak bagging or hot spring soaking. Thru-hikers tend to keep to a relatively disciplined clip and maintain a schedule that is driven by food resupply needs, completing a predetermined number of miles each day. Such is the common and sensible approach for thru-hikers that leaves little time (or energy) for side trip exploration. Meticulous pre-planning is critical to a successful JMT thru-hike, where advance permits and trailhead campground reservations are required. In addition, in order to have the needed energy and food for the full duration of the journey, three to four food resupply points must be organized beforehand via shipment and payment to one of the food cache points located on or near the trail (more on this below). Most hikers take around three weeks to complete the journey following the trail southbound (SOBO) from Yosemite Valley to Mount Whitney, with some hearty souls completing it in two. SOBO is the more common direction for thru-hikers because the relatively gradual climb in elevation allows hikers to acclimate and build up endurance as they work their way toward the high elevation passes and summit of Mount Whitney. Alternately, some choose to do the JMT northbound (NOBO), particularly those setting out on the trail for a second or third time. The steep, arduous climb up Mount Whitney on the first day is a deterrent to most. The JMT is considered the crown jewel trail of the Sierra Nevada, traveling through some of the most impressive and scenic terrain in the range. In doing so, the JMT traverses three national parks and two large swaths of designated wilderness, the Ansel Adams Wilderness and the John Muir Wilderness. In terms of elevation gain, the JMT is no slouch, climbing 10 mountain passes over 10,000 feet and topping out at the highest point in the lower 48 for a total elevation gain of over 45,000 feet. The official northern terminus of the JMT begins in Yosemite National Park. At 4,000 feet, the Happy Isles Trailhead is located in the eastern end of Yosemite Valley. This is also the lowest point along the trail. Obtaining permits at Happy Isles can be challenging, so some opt to start from alternate trailheads near Tuolumne Meadows or Glacier Point, bypassing the first few thousand feet of climbing up the Giant Staircase past Vernal Falls and Nevada Falls. En route to Tuolumne Meadows, many choose to add a day and check off the glacially polished summits of Half Dome or Clouds Rest, given their close proximity to the trail. Beyond the Half Dome Trail the JMT passes by some well-known Yosemite landmarks before descending to Tuolumne Meadows. The trail traces Tuolumne Meadows eastward for a few miles before beginning its southward progression, climbing up and out of Yosemite National Park over 11,050-foot Donahue Pass. Beyond Yosemite the JMT heads south through the Ansel Adams Wilderness and into some incredibly scenic lake country below the Ritter Range and Minarets, before dropping into the Devils Postpile and Red's Meadow area, a food resupply point near Mammoth Lakes. The trail continues southward and crosses into the John Muir Wilderness, skirting above and then down into Cascade Valley before ascending the 10,900-foot Sliver Pass. Beyond Silver Pass the JMT descends toward the eastern end of Lake Thomas A. Edison, where there is access to the Vermillion Valley Resort food resupply by way of ferry. Leaving Lake Thomas A. Edison, the JMT climbs 10,870-foot Selden Pass and then descends into the Muir Trail Ranch area, the JMT's approximate halfway point, where hot springs and an alternate resupply point to Vermillion Valley Resort is available. Continuing south, the trail follows the South Fork of the San Joaquin River and enters into Kings Canyon National Park and onward into Evolution Valley. Following Evolution Creek, the JMT climbs to Evolution Basin, a stark but scenically stunning section en route to Muir's namesake hut, which sits on top of 11,950-foot Muir Pass. The descent from Muir Pass follows the upper reaches of the Middle Fork of the Kings River into LeConte Canyon and splits off to follow Palisades Creek toward a lengthy ascent known as the Golden Staircase en route to Mather Pass at 12,080 feet. From Mather Pass the JMT descends to the South Fork of the Kings River before climbing again to 12,100-foot Pinchot Pass and then dropping again to the Woods Creek suspension bridge crossing. From Woods Creek the JMT climbs to picturesque Rae Lakes Basin en route to Glen Pass at 11,980 feet. Continuing south from Glen Pass the JMT drops into Bubbs Creek Canyon, crossing the Kearsarge Pass trail junction, the last food resupply option via Onion Valley. Beyond Bubbs Creek Canyon the trail begins the long climb up to Forester Pass at 13,200 feet, the highest of the JMT's passes, which also marks the border between Kings Canyon and Sequoia National Parks. Continuing south, the JMT crosses Tyndall Creek and traverses Bighorn Plateau before beginning the climb toward Whitney via Crabtree Meadow and Guitar Lake. The JMT officially ends on the 14,505-foot summit of Mount Whitney; however, it's still 11 miles and a 6,000-foot descent to Whitney Portal via Trail Crest to get back to civilization. Wilderness permits are required for all parties undertaking the JMT. Permits are applied for from the managing agency overseeing the respective trailhead that is used to access the JMT. Managing agencies include Yosemite National Park, Inyo National Forest, Sierra National Forest, Kings Canyon National Park, and Sequoia National Park. Since most aspiring JMT hikers start in Yosemite, they must apply for a permit directly from Yosemite National Park. Hiking the JMT has become increasingly popular in recent years, which has made obtaining permits from Yosemite trailheads notoriously difficult during peak season. Overuse and Yosemite trailhead quota competition with hikers staying within the borders of Yosemite National Park led the National Park Service to overhaul the JMT permit system in early 2015. Under the new system, the park implemented an "exit quota" limiting the number of people permitted to exit Yosemite National Park over Donahue Pass to no more than 45 per day across all trailheads, effectively limiting the number of SOBO JMT hikers. On the Yosemite National Park Wilderness Permit Reservation Application there is a check box asking if you plan to exit over Donohue Pass, which must be checked if you are planning on doing the JMT. Using the exit quota system, Yosemite National Park is better able to manage overuse of JMT sections within the park and better able to balance wilderness permit allocation between JMT hikers and others looking to use the same trailheads while staying within Yosemite National Park. Permit Reservation Forms can be found through the Yosemite National Park Wilderness Reservation system. They cost $5 per person. Only one permit reservation is required per party. Yosemite National Park accepts permit applications beginning 24 weeks (168 days) in advance when the wilderness permit reservation office is open (mid-November through October). Reservations should be made as early as possible as some trailheads are known to fill up on the first day the reservation becomes available. See Wilderness Reservation Calendar for details. JMT hikers have four trailhead options within Yosemite: Happy Isles, Glacier Point, Sunrise Lakes/Tenaya Lake, and Lyell Canyon/Tuolumne Meadows. A total of 45 exit quota spots are allocated per day for JMT hikers exiting Yosemite over Donahue Pass. Twenty-five spots are available for JMT hikers leaving from the Lyell Canyon Trailhead in Tuolumne Meadows; the remaining 20 are available for JMT hikers beginning from Happy Isles, Glacier Point, and Sunrise Lakes Trailheads by advanced reservation/lottery system. Lyell Canyon is the only trailhead location for which walk-up or first-come, first-served permits will be issued. These are limited to 10 per day. Walk-up permits are available beginning 11 a.m. the day before JMT hikers would like to start their hike at any of the wilderness permit issuing stations. JMT hikers must indicate where they plan to camp their first night. There are limits near the five High Sierra Camps and in the Little Yosemite Valley areas. If hikers want to hike Half Dome while doing the JMT, this must be checked on the permit application and will require a separate permit available for $8 per person. Half Dome may also affect one's ability to get their desired starting date. JMT hikers planning to hike the entire JMT should list Whitney Portal as the exit trailhead on the permit application along with the exit date. If hikers are unsure of exact exit date, it is recommended to overestimate by a day or two. JMT hikers cannot be on the trail after their permit exit date. Wilderness permits are required for overnight use year round, and advanced reservations are not required November through April. Additional information on wilderness permits for Yosemite National Park can be found on the Yosemite's Wilderness Permits page, and information specific to wilderness permits for JMT hikers is on its own permits page. Hikers can also access the JMT from multiple trailheads outside (i.e. south) of Yosemite National Park. Depending on the location of the trailhead, JMT hikers should look to obtain a permit from one of the land management agencies listed above. Most permits can be applied for up to six months in advance; some up to a year in advance. Those thru-hiking the JMT will need to plan for and pre-arrange food resupplies at points along the trail. Not only does this afford JMT hikers a re-up on food and energy, it also allows for hikers to dispose of any trash that has accumulated from prior days on the trail. Fortunately there is an existing food resupply system in place that is supported by land owners, outposts, and horsepack outfitters operating near the trail that service thru-hikers on the JMT and the Pacific Crest Trail (PCT). For some of these food resupply service locations it may be convenient to drop the packages on the drive to the trailhead. Others will want to ship the food resupply packages. Another option is to have friends or family meet hikers at predetermined trail locations, typically at relatively accessible trail junctions or at one of the common resupply points listed below. Any combination of shipping food, dropping off food, and meeting friends or family on the trail is also possible. Most thru-hikers plan to resupply three times along the JMT. Some may add an additional resupply with some goodies stashed in Tuolumne Meadows for early resupply on the trip. If hikers will be using one of the resupply businesses, they will need to ship a food package in advance of arriving at the resupply point and pay the associated fee. Tuolumne Meadows (mile 22) - Most JMTers skip this option, but if you are taking it slow or just really trying to trim down weight during the first few miles there is the option to pick up provisions in Tuolumne Meadows. JMT hikers can either drop off provisions in a bear locker before they begin the hike or mail packages to the Tuolumne Meadows Post Office. If hikers will be using the post office, make sure to arrive in Tuolumne Meadows when the post office is open: Monday through Friday from 9:00 a.m. to 5:00 p.m. and Saturday from 9:00 a.m to 12:00 p.m.
Red's Meadow Resort and Pack Station (mile 58) - This rustic mountain resort outpost is located west of Mammoth Lakes, near Devils Postpile National Monument and is a popular stopover for JMT and PCT hikers. JMT hikers picking up food resupply packages typically use the nearby backpacker's campground that carries a $22 fee. Red's Meadow also houses a general store, showers, a cafe, and lodging. Learn more about Red's Meadow food resupply here. Traveling down to Mammoth Lakes is also possible by way of shuttle. If hikers will be dropping food packages off at Red's Meadow during summer, the shuttle must be used as cars are not permitted to drive into Devils Postpile/Reds Meadow during peak summer season. Vermillion Valley Resort (mile 88) - Another summer-oriented rustic mountain and remote resort on the west side of the Sierra, located just beyond Shaver Lake. The resort is located on the west shore of Lake Thomas A. Edison and approximately 4 miles from the JMT, which passes near the east shore of the lake. Most use the resort's water taxi/ferry service to get over to the resort from the trail. VVR has lodging, a camp store, and showers. Given the close proximity to Muir Trail Ranch located 20 miles down the trail, JMT hikers typically choose between one or the other for food resupply. More information on food resupply at VVR can be found here. Muir Trail Ranch (mile 110) - Another and perhaps more convenient alternative to Vermillion Ranch Resort given it's close proximity to the trail, Muir Trail Ranch is the official halfway point along the JMT. Muir Trail Ranch offers food resupply and also has a small store, private cabins, and a restaurant. Note that showers, bathrooms, and restaurant facilities are available to cabin guests only, and these can can be booked in advance by JMT hikers. There is a free backpacker's campground in close proximity to the Muir Trail Ranch as well as a nearby hot springs to soak weary bones. Additional information on food resupply at Muir Trail Ranch can be found on the here. Arrange for friends to do a drop off at the bear lockers in Onion Valley a day or two prior to your arrival or have them meet you on the trail near Kearsarge Pass. Utilize the Mount Williamson Motel food resupply service based out of Independence. They offer a resupply drop-off at Onion Valley in exchange for donations benefiting the Sierra Nevada Bighorn Sheep Recovery Program. The motel also offers lodging and food packages. Additional information on Mount Williamson Motel resupply can be found here. Organize a horse pack service operating out of Onion Valley for resupply on the trail. Berners Pack Service is one such service. Proper food storage in bear canisters and/or bear boxes is required throughout the length of the JMT. While bear boxes exist at some designated backcountry campsites along the trail, most parties will set up camp where bear boxes are not available. Therefore, bear canisters must be carried and used to store food, a requirement set forth in the wilderness permit. JMT hikers can rent bear canisters from ranger stations and wilderness permit offices, but given the length of the JMT many will opt to purchase one. A list of NPS approved bear canisters is provided here. SOBO hikers will complete the JMT and exit at Whitney Portal, which is located 11 miles west of Lone Pine, California. Whitney Portal has a store, cafe, and showers available. There is also a backpacker's campground located near the top of the portal. A night's stay on the exit date is included with one's permit. Regarding transportation back to Yosemite, those finishing the JMT can pre-arrange a pick-up from family or friends, hire a private shuttle service, or head into Lone Pine and take public transit to Mammoth Lakes, changing buses there to get to Yosemite. If hikers will be using public transit, more information can be found at Eastern Sierra Transit and YARTS/Yosemite Area Regional Transportation System.